Self-driving cars (SDC) that include driver control are expected to hit highways around the globe before 2025 and self-driving “only” cars (only the car drives) are anticipated around 2030, according to an emerging technologies study on Autonomous Cars from IHS Automotive. 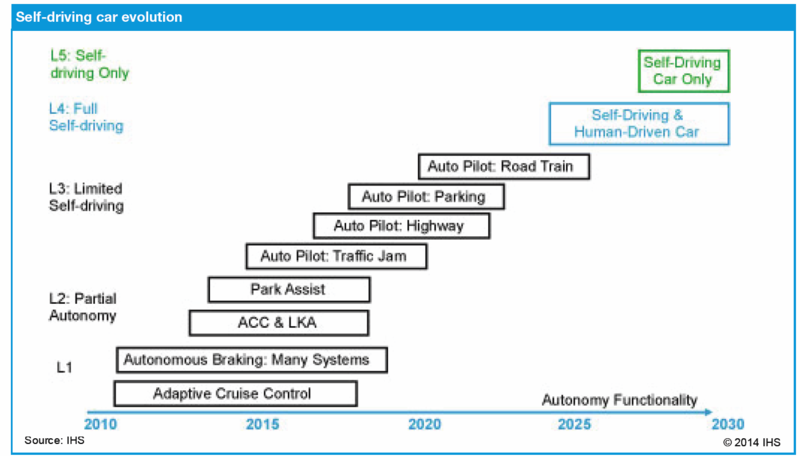 In the study, “Emerging Technologies: Autonomous Cars — Not If, But When,” IHS Automotive forecasts total worldwide sales of self-driving cars will grow from nearly 230 thousand in 2025 to 11.8 million in 2035 — 7 million SDCs with both driver control and autonomous control and 4.8 million that have only autonomous control. In all, there should be nearly 54 million self-driving cars in use globally by 2035. 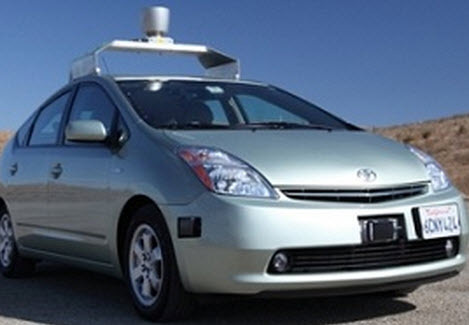 Several automakers have said publicly they will have autonomous cars by 2020, or earlier. Autonomous car technology is already affecting driver assist systems such as adaptive cruise control, lane keep assist, and collision mitigating brake systems. Additionally, the IHS study says the first group of autonomous cars will have so-called Level 3 capability — limited self-driving that enables the driver to cede full control of all safety-critical functions under certain traffic and environmental conditions and includes auto pilot for highway travel and parking. Coming later in the decade will be SDCs with Level 4 capability — self-driving but with human controls. KurzweilAI asked Dr. Egil Juliussen, principal analyst for infotainment and autonomous driver assisted systems at IHS Automotive, to comment on the following questions. How do these forecasts on on self-driving cars compare to other ones? EG: I am not aware of any other forecasts on self-driving cars. It is a little early to make such forecasts. This was done as a part of a large multi-client study called “New Urban Mobility” that looked at the major aspects of the auto industry until 2035. It became clear that self-driving cars would have a growing impact on the auto industry and I spent several months researching the technology and other elements of self-driving cars. The report that was released was extracted from this project. Is Google in agreement with the dates? I have the impression that they are anticipating earlier dates for level 5 [fully self-driving]. EG: I don’t know if Google agrees. Hopefully they will buy the report and give us some feedback. Google is ahead of the auto OEMs today, and is likely to be a technology supplier at some point. The Level 5 or self-driving-only car (without driver control) has not been discussed much and we believe it will come 5 years later than the SDC [self-driving car] that can also be controlled by a driver. I would think that Google will be thinking about this too, but they have not said anything about this topic. What about highway and road redesign to facilitate level 4 and 5? Is it necessary and if so, for what types of roads? We did not address this topic, but it is an interesting question. The SDC has to be designed to drive on existing road infrastructure. Over time it is possible that the road infrastructure may be modified, but that is a long time off.